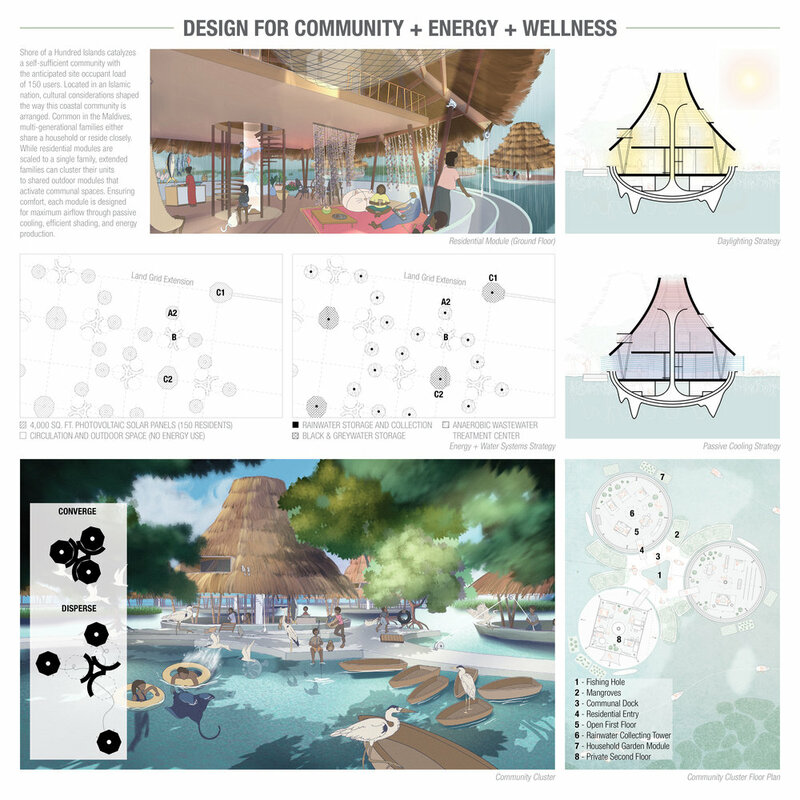 Bachelor of Architecture students Viviani Isnata and Maria Ulloa from the fall 2018 Buoyant Ecologies Maldives studio have been announced as winners of the AIA COTE Top Ten / Innovation 2030 Student Design Competition. The American Institute of Architects Committee on the Environment (AIA COTE), in partnership with Association of Collegiate Schools of Architecture (ACSA), selected the recipients of the national awards. The competition recognizes ten exceptional studio projects that demonstrate designs moving towards carbon-neutral operation through creative and innovative integration of design strategies such as daylighting, passive heating and cooling, materials, water, energy generation, and sustainable systems. The program challenged students to submit projects that use a thoroughly integrated approach to architecture, natural systems, and technology to provide architectural solutions that protect and enhance the environment. Jurors included David Dowell (El Dorado Inc.), Bradford Grant (Howard University), Matthew Noblett (Behnisch Architekten/Partners), and Mary Demro (Montana State University). The Buoyant Ecologies Maldives advanced Integrated Building Design studio, led by CCA faculty Margaret Ikeda, and Evan Jones, is part of an ongoing research partnership between CCA, Autodesk's Pier 9 Workshop, Kreysler & Associates, and the Benthic Lab at Moss Landing Marine Laboratories. The research is focused on developing innovative material approaches to resilient waterfront structures. 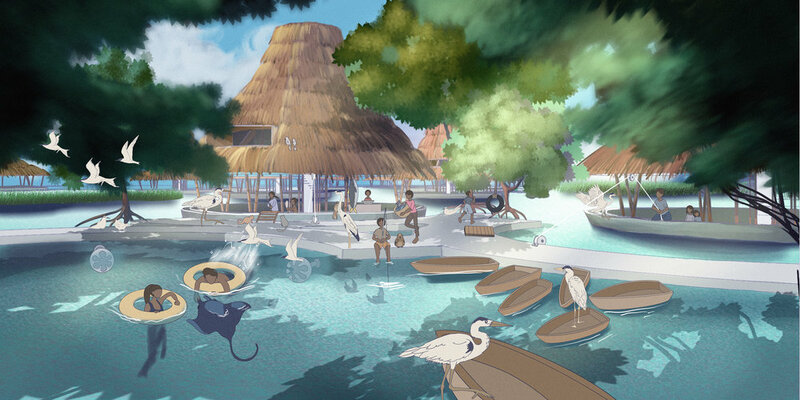 The selected project, Shore of a Hundred Islands by Viviani Isnata and Maria Ulloa, proposes a a self-sustaining, buoyant community that blurs the line between land and water. The floating buildings provide habitats for both humans and non-human species such as marine invertebrates and plants. The buildings integrate a modular system of floating wetlands that treats wastewater and benefits the surrounding ecosystem. From the jury citation: "Shore of a Hundred Islands presents an imaginative approach towards the growing issue of rising sea levels. It demonstrates a compelling intersection of traditional form and modern function while also giving careful consideration to aquatic ecology. Within strict programmatic and environmental constraints, the design provides solutions to cultivating both community and privacy. The Public Sediment team (which includes AEL directors Adam Marcus, Margaret Ikeda, and Evan Jones) has won an Honor Award from the American Society of Landscape Architects, New York Chapter, for their Unlock Alameda Creek proposal. The project was developed within the framework of the Resilient By Design Bay Area Challenge, a year-long research and design initiative exploring new design approaches to sea level rise and climate change. The Public Sediment team (which includes AEL directors Adam Marcus, Margaret Ikeda, and Evan Jones) has won an AIA California Merit Award in the Urban Design category, for their Unlock Alameda Creek proposal. The project was developed within the framework of the Resilient By Design bay Area Challenge, a year-long research and design initiative exploring new design approaches to sea level rise and climate change. The Buoyant Ecologies Float Lab, a project led by CCA AEL directors Adam Marcus, Margaret Ikeda, and Evan Jones, has been selected for a 2018 R+D Award by Architect Magazine. The project builds upon four years of applied research into ecologically productive materials for waterfront structures, and it was developed in collaboration with marine ecologists at the Benthic Lab at Moss Landing Marine Laboratories and fiber-reinforced polymer (FRP) manufacturers at Kreysler & Associates. The Float Lab is a prototype for a floating breakwater that incorporates an ecologically optimized FRP substrate on the underside, which is designed to encourage the growth of diverse marine invertebrate habitats. The accumulation of marine life is optimized such that the resulting biomass helps to attenuate waves and potentially mitigate coastal erosion. The Float Lab recently received a permit from the San Francisco Bay Conservation and Development Commission for a three-year deployment at Middle Harbor Shoreline Park, located in the Port of Oakland. The prototype will be launched later this fall. Master of Architecture students Clare Hačko and Nicholas Scribner from the fall 2017 Buoyant Ecologies Maldives studio have been announced as winners of the AIA COTE Top Ten / Innovation 2030 Student Design Competition. Jurors included Karin Bjorkman (Nola | Van Puersem Architects), Justin Brown, (MASS Design Group), Chris Chatto (ZGF Architects), Thomas Fisher (University of Minnesota), and Jeanne Gang & Juliane Wolf (Studio Gang). The selected project, Dis/Placement by Clare Hacko and Nicholas Scribner, proposes a floating community of fiber-reinforced polymer composite structures for the Maldives. The floating buildings integrate an innovative and dynamic bladder system that collects rainwater and provides ballast support for the structures. 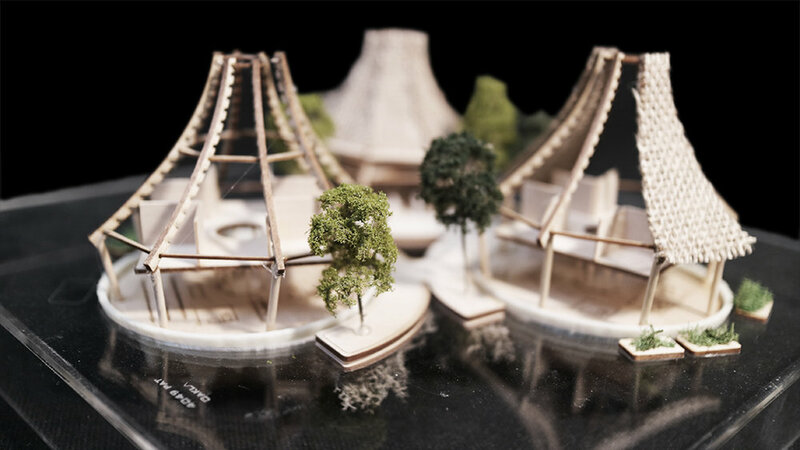 From the jury citation: "This interesting study brings attention to climate change and rising sea levels by imagining a floating community in the Maldives. The students understood how to work with a different ground planes and included an exploration of what it would be like if you could see a building from below. Above ocean the design is a simple modern style, while underwater “bladders” create ballast and an ocean microecosystem." Master of Architecture students Madeline Cunningham and Taylor Metcalf from the fall 2016 Buoyant Ecologies studio have been announced as winners of the AIA COTE Top Ten for Students awards. The American Institute of Architects Committee on the Environment (AIA COTE), in partnership with Association of Collegiate Schools of Architecture (ACSA), selected the recipients of the national awards. The competition challenged students to submit projects that use a thoroughly integrated approach to architecture, natural systems, and technology to provide architectural solutions that protect and enhance the environment. The Buoyant Ecologies advanced Integrated Building Design studio, led by CCA faculty Adam Marcus, Margaret Ikeda, and Evan Jones, is part of an ongoing research partnership between CCA, Autodesk's Pier 9 Workshop, Kreysler & Associates, and the Benthic Lab at Moss Landing Marine Laboratories. The research is focused on developing innovative material approaches to resilient waterfront structures in the San Francisco Bay. The selected project, SubOrdinate by Madeline Cunningham and Taylor Metcalf, proposes a new ecological research and education center for Middle Harbor Shoreline Park in the Port of Oakland. From the jury citation: "This innovative project pushes thinking in resilient design by taking a new approach to sea level rise: not by fighting it, but working with it. The attitude is animal-centric and non-confrontational and shows how architecture can adapt to an environment rather than control it. The students also consider the longevity of the project by showing a 100-year progression. The exploration of improving the relationship between nature and built environment is a complicated topic that is resolved impressively." Master of Architecture students Rafael Berges, Jared Clifton, Vaama Joshi, and Shirin Monshipouri from the fall 2015 Buoyant Ecologies studio have been announced as winners of the AIA COTE Top Ten for Students awards. The selected projects, Augmented Tides by Rafael Berges and Jared Clifton, and Inverted Ecologies by Vaama Joshi and Shirin Monshipouri, propose new ecological research and education centers for Middle Harbor Shoreline Park in the Port of Oakland. Augmented Tides proposes a system of "tidal columns": a field of floating platforms that foster a variety of tidal wetland habitats above and below the water, always in flux with changing water levels. Inverted Ecologies proposes a large subterranean space, capped with a highly performative vaulted structure that incorporates plantings, aquaculture, and water recycling infrastructure as educational features of the building.